This Dora backpack cake was my first attempt at a fondant cake. In fact I’m pretty ambitious and decided to make the fondant from scratch (something I had to try but wouldn’t recommend nor would I attempt it again!). I started with a standard yellow cake recipe (from scratch of course!) in two 9" round pans. 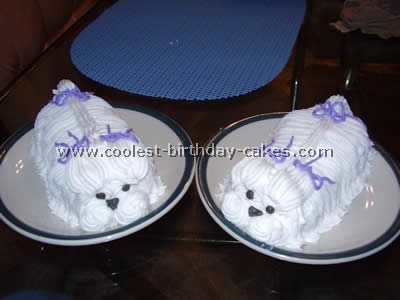 After they were fully cooled I used a standard buttercream frosting recipe and put a layer of icing between cake layers. 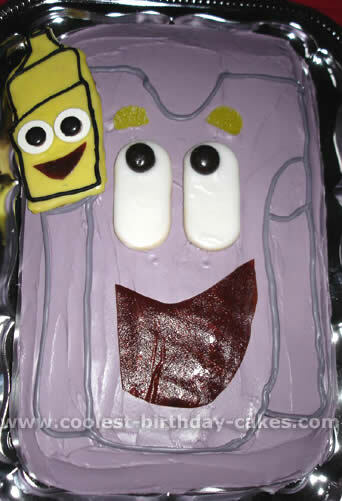 I found pictures of the Dora backpack in my daughter’s storybooks and used that as a guide to free-form cut the cake into the Backpack shape. Baking the layers in a round pan helped as I was able to keep the curves of the base symmetrical. The fondant was divided into a few portions, one left white for the eyes and the map. Another portion to be used for the main body was colored using Wilton’s violet gel coloring. I used a toothpick to introduce small amounts of color to the fondant so as not to over color it. Another was colored Christmas Red for the mouth and a smaller portion was colored yellow for the eyebrows. As the color was kneaded in I noticed the fondant getting fairly sticky and was able to remedy this by adding confectioner’s sugar. All facial pieces were hand cut with a paring knife again using storybooks as a guide. After the violet fondant was rolled (rolling pin didn’t have a pasta machine handy though it would have made life much easier) and placed over the cake it was smoothed by hand and trimmed along the base. All facial pieces were attached with a very small dab of icing. 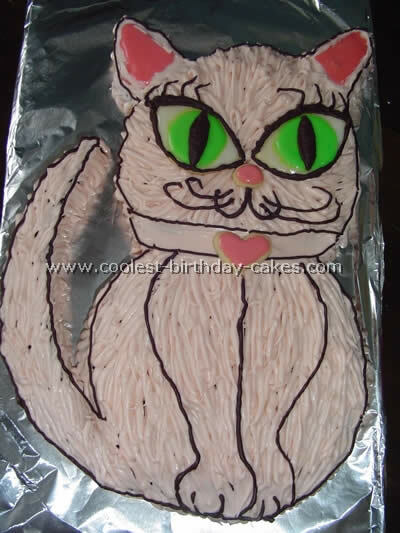 The eyes and mouth were outlined with piped black icing. The flap on the top of Backpack is just a section of rolled fondant leftover from the main body gently laid over the top. Map on the left is rolled up layer of white fondant secured into place by a fondant "pocket" which is attached with icing. I made a separate sheet cake (not pictured) using map as the feature because I thought I wouldn’t have enough cake! 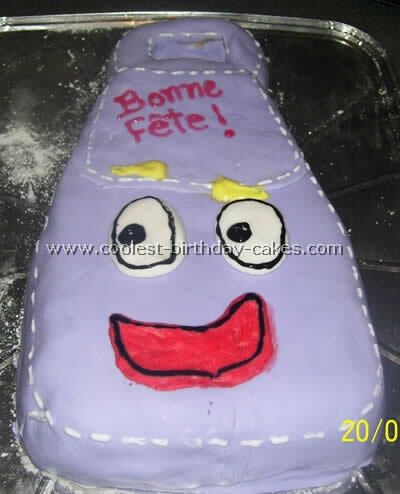 This Dora backpack cake came to me as a prefect cake to make for my daughter’s 2nd birthday. She received a Dora Backpack for Christmas and from that day on she didn’t let it out of her sight. Using one cake mix the cake was made out of a 9" x 13" sheet pan. When completely cooled I cut off the edges to form the bottom part of back. With the cut pieces I made the handle. I frosted the entire cake with butter cream frosting (which I made from scratch) then I used fondant (which as colored with Wilton’s color tint) in purple. The overlapping piece of fondant was designed to make the Backpack top flap. The eyes are also white fondant that I cut out into oval shapes. The rest of the decorations on the cakes are made out of Decorator’s Gel. It was a big hit at the party. My daughter really loved it, she cried when I started cutting into it to serve. 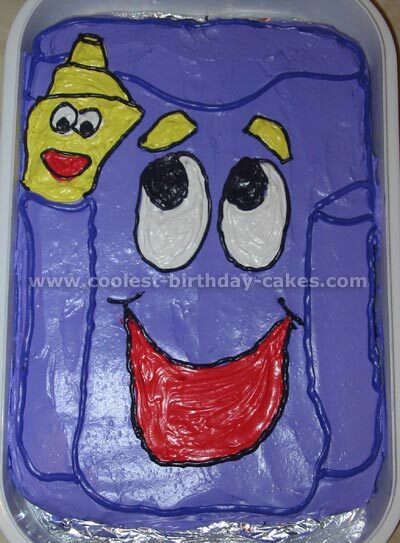 This Dora cake was made by using a 9×13 pan. Purple frosting covered the entire thing. The "map" was made by using a cut and frosted graham cracker. The eyes of the map were Necco wafers and M&M’s. The mouths were fruit roll-ups. Backpack’s eyes were frosted Vienna fingers and junior mints. 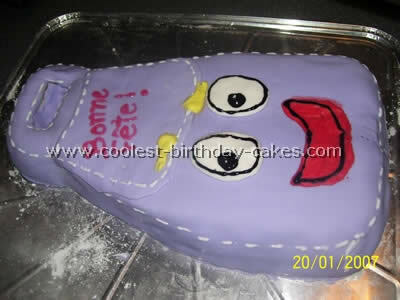 I was inspired by another Dora cake I saw on this website. 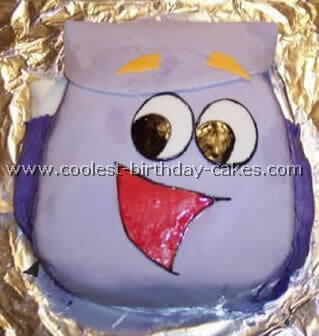 For our 3 year old’s Dora party we had a Dora Backpack cake, which I found easier to draw than Dora. It is just a 2-cake mix rectangle pan with Backpack and Map drawn on it.